Miguel Mena lives in Zaragoza, where he works as a journalist and leads a daily radio program. 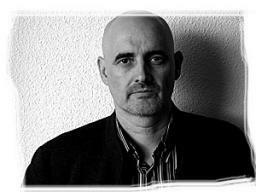 He has published scripts, articles, reports and novels for young readers, such as Bendita calamidad (Alba, 1996), El escondite inglés (Alba, 1997), Cambio de marcha(Alba, 2002) and Alerta Bécquer (Alba, 2011). With the novel, Días sin tregua (Destino, 2006), awarded with the Málaga Prize of Novel, he introduced the inspector Luis Mainar to the readers. After publishing Piedad(Xordica, 2008) a personal tribute to his son Daniel, he published two new installments of Mainar’s adventures: Todas las miradas del mundo (Suma de Letras, 2013) and Foto movida (Suma de Letras, February 2014). His latest published novel is Alcohol de quemar(Tropo, October 2014).